Sure, Ryan Adams sells out Red Rocks and appears on NBC’s The Voice nowadays, but back in the late ‘90s he was just another struggling songwriter with his band Whiskeytown, about to release Strangers Almanac and hitting the road. It was during this time that Thomas O’Keefe – former bassist with ANTiSEEN -was roped into road managing the fledging star. This engrossing book begins with EMTs attending to Adams, (a not infrequent occurrence during O’Keefe’s tenure with Whiskeytown) in Seattle in 1998. The story that follows is hardly a new tale – rock star gets drunk, destroys club, fires band (a few times), opens for classic rockers (in Whiskeytown’s case, John Fogerty) and generally acts like a spoiled brat. Anyone who has spent any amount of time around the music business will relate. The industry is full up with drunken talents with an inflated view of themselves. It’s as common as the stench of draft beer at a club sound check. So why do the O’Keefe’s of the world stand for it? It ain’t the paycheck, surely. It’s because for all the idiots you encounter, you find a diamond in the rough. And Ryan Adams and Whiskeytown were surely that. As a road manager you get all the crap, without the glory. You have to sober up the star, chase down club owners for pay, setup and tear down a stage, night after night. You do it because for all the frustration, your troublesome singer can demolish you with just a song – in this case, “Avenues” from Strangers Almanac onstage at The Brewery – that makes you forget that 15 minutes before you were ready to quit and catch the next flight home. It’s the genius that keeps you around. 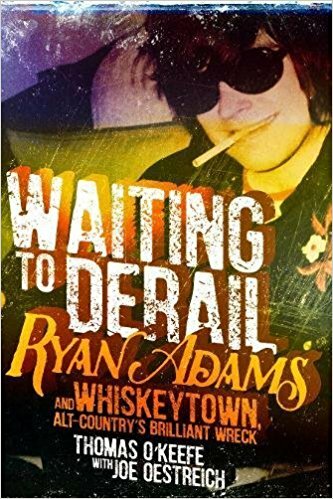 The book captures the end of Whiskeytown and the beginning of Adams solo career, and is full of the sort of tales you’d expect – smashed guitars, bad gigs and a revolving cast of fellow musicians such as latter-day Whiskeytown guitarist – ”Ed from Ohio” – Ed Crawford from fIREHOSE – along for the ride. And what a ride it was. O’Keefe went on to working with Weezer and Ryan Adams went on to fame and fortune (while seemingly still being a brat). But to many fans, he’s never equaled Strangers Almanac and Whiskeytown. For those fans, Waiting To Derail is golden, and worth whatever misery O’Keefe had to endure along the way. Vital.